On November 24, Deutsche Grammophon will release a special, live concert performance on DVD entitled, 'Sting: A Winter's Night... Live from Durham Cathedral'. 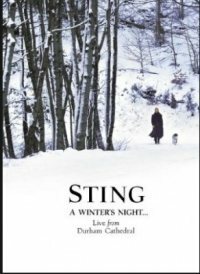 Filmed at the magnificent Durham Cathedral near Sting's hometown of Newcastle-upon-Tyne in Northern England, the DVD features music off his forthcoming album, 'If On A Winter's Night...' in-stores, October 27. Recorded in HD and produced by Universal Music Classical Management & Productions (UMCMP), in association with Thirteen for WNET.ORG, the program will premiere on PBS's Great Performances series on Thanksgiving night, Thursday, November 26 at 9 pm EST (checking local listings). International broadcasts are planned for later this year, with further air dates to be announced locally in each country. 'Sting: A Winter's Night... Live from Durham Cathedral' captures the artist in the unique setting of England's most famous cathedral. Standing on a peninsula overlooking the River Wear in Durham, the one thousand year old UNESCO world heritage building is one of the most iconic landmarks of Northern England. Inside Durham Cathedral, the architecture and atmosphere is as equally inspiring and it is in this setting that Sting was joined by guest musicians including local Newcastle artists Kathryn Tickell (Northumbrian pipes and fiddle), Peter Tickell (fiddle) and Julian Sutton (Melodeon). Esteemed performers from around the world also include Dominic Miller (guitar), Vincent Ségal (cello), Scottish harpist Mary Macmaster, Ira Coleman (bass), Chris Gekker (trumpet), David Mansfield (violin and mandolin), Cyro Baptista, Bashiri Johnson and Rhani Krija (percussion) and vocalists Laila Biali, Lisa Fischer, Jo Lawry, and Steven Santoro. Producer, Robert Sadin conducted the ensemble of 35 musicians, which includes additional string and brass sections. Both the new album and DVD conjure the mood and spirit of the season with a diverse collection of songs, carols and lullabies spanning the centuries. Featuring traditional music of the British Isles as its starting point, Sting and guest musicians interpret stirring, folk-based melodies including 'The Snow it Melts the Soonest' (traditional Newcastle ballad), 'Soul Cake' (traditional English "begging" song), 'Christmas at Sea' (traditional Scottish song), 'Gabriel's Message' (14th century carol), 'Balulalow' (lullaby by Peter Warlock) and 'Now Winter Comes Slowly' (Henry Purcell). Two of Sting's own compositions are also featured: 'Lullaby for an Anxious Child' and 'The Hounds of Winter',' which originally appeared on his previous release 'Mercury Falling'. In addition, the DVD programme features a setting of the 'Coventry Carol' in which Sting and musicians are joined by the Durham Cathedral Boys' Choir, as well as songs not included on the album - Peter Warlock's haunting 'Bethlehem Down', a lively arrangement of the traditional song 'I Saw Three Ships' and Sting's own 'Ghost Story'. 'Sting: A Winter's Night... the Documentary' features a behind-the-scenes look at the concert's genesis, beginning with the album recording sessions at Sting's home in the Italian countryside, leading up to the final rehearsals at Durham Cathedral. Along the way, Sting revisits places from his childhood and reunites with old friends and band mates, swapping stories and reminiscing. Featuring both a compelling live concert and evocative film footage, 'Sting: A Winter's Night...' was directed and produced by the Emmy award winning team, Jim Gable and Ann Kim of Graying & Balding, Inc.